Be sure to say thank you. Be kind to your brother. Act like you are somebody. You don’t always have to be first in line. I say all of these things and many, many more to one or another of my crew at least once a day and then some. But there’s one thing that I used to say that I found myself almost saying today that I will be very careful about ever saying again. Cooter had one of his activities today. After he finished I asked him how it had gone. He shrugged. This is one of the very few times he’s not outnumbered by all the estrogen in the room, and I know he can get rowdy along with the best of them–all those boys. Whew. I asked him how. He proceeded to call one of the others “creepy” and I corrected him. No name-calling. That is not okay. And there it was. On the tip of my tongue. Only I caught myself just in time. A glance in the rearview mirror assured me that he was serious. It’s been a little over a year since I had the conversation with my oldest where she shared what she had read–that we shouldn’t tease anyone about someone being mean because they have a crush on them. We don’t want anyone to equate meanness or cruel words or hurtful actions with affection. Not when they’re little. Not ever. And this takes it one step further. If I were to tell Cooter, now be nice, he just wants to hug you, that means he wants to be your friend, imagine how that could mess him up later on. Sure, this is all innocent–a boy who is younger than him, wanting to hug it out because he wants to be friends. Just a year ago, that was very likely how Cooter was with his older friend there. But what if? What if later on someone else’s “touch” gives him the “creeps,” and I’ve set the precedent of ignoring those feelings, not giving them validation, and told him to “be nice,” that they just want to be his friend. I have to show him I trust him now, that I respect his “creepy” feelings if I want him to continue sharing these things with me and be able to stand up for himself. It’s a scary and wonderful world we live in. And as I’ve said before, this raising of the children is not for the faint of heart. These children with their precious little selves, always listening and watching and paying attention and not always when you really want or need them to, they are so fragile and strong. So vulnerable and wise. So innocent and knowing. All of that. I don’t want to mess this up. It’s so hard to know what’s right, you know? It is so instinctual for me to want my children to be kind, to be polite, and to be respectful. It was on the very tip of my tongue to correct my boy, to crush any hope of him talking about this kind of thing to me again–all with those two simple words. Be. Nice. Instead I gathered my thoughts, and told him that I could appreciate how that made him feel uncomfortable. I suggested that next time, if it happens again, he should step back and put his hand up and say, “Hey, I can be your friend, but I don’t want to be hugged.” And if the little guy doesn’t stop, he should go and let a grownup know that he doesn’t care to be hugged. I don’t know. It’s so hard to know, isn’t it? All I can do, as my Mama often said, is the best I can do with what I have now. And right now, I think the most important thing is for each of my children to feel heard and know that they can bring any story, anything at all, home for me to hear. I can’t promise not to flip out–it’s kind of my thing (yes, another thing)–but I can promise I won’t leave their side. Not even once. “Stickered” by my little guy. Not a prouder Mama anywhere around. Love that boy. 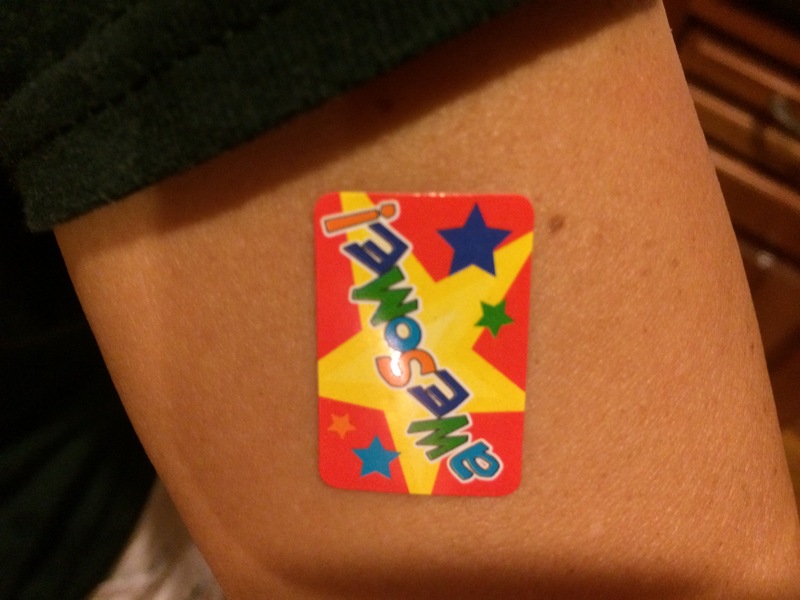 I guess I must have done okay because Cooter gave me his sticker from today. He smiled so brightly (oh how I love that toothless grin) and seemed plum tickled with himself over it. I wore it proudly all afternoon and evening. Let folks stare. My baby boy thinks I’m awesome. And tonight I’m thankful for that. And so much more. Mess Cat was over today, and we just visited. The way folks do. Sat on the furniture that’s for sitting and talked about a little bit of everything. It was awesome. She’s been working on home projects and so have I, so this was a nice respite for us, as our littles played together. We started talking about our personalities and how they are different. An incident from when I was in fourth grade came to mind. My teacher, Mrs. W, who had taught my Daddy and my Uncle, was teaching us about quotation marks. We were to write a sentence using quotation marks. Correctly. She asked a few of us to write our sentences on the chalkboard. I loved writing on the chalkboard. Something that has continued on to the whiteboards in my adulthood. So I was thrilled when she called on me. I went up and wrote my sentence on the board. I had tried to step outside the box and make my sentence a little different. Which doesn’t even make sense, am I right? I was a people pleaser. So I never said a word or tried to explain myself. That was 36 years ago. And I’m still carrying it. What is that about? I told Mess Cat today that I’m trying to outgrow that, living as others expect, trying to people please. It hasn’t always been healthy for me, holding in what I’m really thinking, what I really believe. And I’m paying for it, so I’ve decided no more. I’m not talking about showing out or picking fights. I’m just going to quit apologizing for certain things I do or say or believe. Y’all. For the love. I busted out laughing. Forget monogramming. I am so having that put on something. A name I’ll wear with pride. Because I am. You got it. And baby girl, I know you are 18. Legal in different ways, still not in others. However, here’s what you need to know and I’m not sorry a bit. I will always be your helicopter Mama. I will be hovering when you are my age, good Lord willing and the creek don’t rise. I love you, I want what’s best for you, and forgive me if sometimes I think I might know what’s what a little better than you do. Or when I ask too many questions. Or when I worry because you got off from work 45 minutes ago and I still haven’t heard anything. *ahem* I’m asking for forgiveness but I am not apologizing. It’s part of what I signed up for nineteen years ago when I was waiting on you to arrive. I hovered then, every little flitter or burp had to be interpreted…..and the first time you had hiccups in utero? Oh my land. Called the doctor I think. Or my Mama. So yeah, I’m the best Helicopter Mama there ever was and will be as long as my blades will turn. You call it hovering, I call it love. And I do. Love you. –I’m done apologizing for my dog barking when folks come over. Yeah, she’s shy. She’s slow to warm up to new people. She barks like mad when someone comes through the door she doesn’t know. However, she loves like nobody’s business, and that is pure joy. Many nights my writing is delayed because she is laying at my right side, patting my right hand, wanting some attention and cuddles. That right there. That’s why I wanted a dog so much. While I wish she didn’t bark quite so much, and that my word about someone being okay could be enough, I’m done apologizing for it. I give thanks she is so attentive and protective of all of us. For such a sweet little fluffball, she’s a smart girl. And she knows who her people are. No more apologizing to servers in restaurants as I explain for the umpteenth time about her allergies and ask them questions. I appreciate their compassion and attention to details and I will compensate them for it, but I won’t apologize for asking what I need to know to make sure she’s going to be okay. No more apologizing to folks when I have to carry separate food for this precious child. She’s okay with it, I’m okay with it, and I hope you will be too. (And I’ve never had anyone who wasn’t–such sweet Mamas at birthday parties–who let me know ingredients beforehand or who say “please, by all means, do whatever you have to do to feel okay for her sake.” This is an issue that is about my mindset, not theirs. For whatever reason I’ve felt like I should apologize for “inconveniencing” someone else, and I’m done with that.) And no more apologizing for the paranoia and OCD that comes with having a child with food allergies. I appreciate your help and your ideas and suggestions, but I’ve got this. I’ve been trusted with this child by a Power Higher than anyone who walks on two feet, so please, trust me too. I’m really trying to trust myself. It’s taken years for me to get where we are today, mentally and in our routine, so yeah, we got this. As “got this” as anyone can be in this situation I guess. It scares me to death on a regular basis just how fragile life is, so I really appreciate those who go out of their way to understand and to join the “Keep Princess okay” team. And there are many of you. Thank you. My house. Oh good gravy. It’s a cluttered mess. Especially right now. In transition. Moving precious memories and things from my growing up home to my home now. I want to be a good steward of all of it, and if I can’t, then I need to let it go. (Is that song playing in your head now? I would apologize, but…..) I want not to feel like I need to apologize every time someone walks through my door. “I’m sorry it’s such a mess.” Oh my. That would be nice. And the only way I can change that is to do something about the clutter. And I am. Oh, it won’t be huge, I guess. We still live, work, play, eat, sleep, and learn here–pretty much 24/7–but it could use some organizing and culling…..and we are on it. Seriously. Be impressed. I did not inherit my Mama’s organization gene. –My faith. My beliefs. My values. So many times I hold my tongue for fear of offending someone else because I know they wouldn’t understand; I know their beliefs are different. I don’t want to upset anyone. And yet, I get so frustrated when I see others who are more conservative with different beliefs being so vocal and adamant that their way is the. Only. Way. I need to reach a better balance. I need to be able to speak my mind, respectfully, without picking an argument. And I need to be able to share my opinions and thoughts gently without feeling apologetic. *deep breath* This is going to take a while. It’s a hard one. But no more apologizing for what or who I am. I just can’t do it, and I’m not being true to myself if I do. –Finally, I am trying to stop apologizing for my slow progress on the whole grief journey. When I was with Hospice many years ago (is it possible that it’s been thirteen years? ), I came across something that blows the whole “wandering on a path” idea of grieving out of the water. 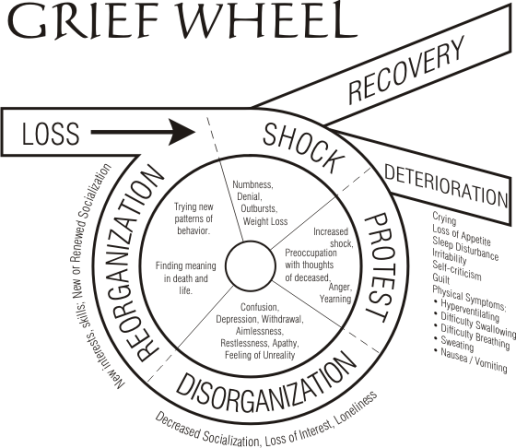 It was a Grief Wheel. And the thing is that you can go round and round on it a few times before heading towards Recovery, and sometimes the least little things–something you come across, a song on the radio, the smell of sweet potatoes baking or squash cooking in the skillet–can send you right back on that wheel again. It’s not a long and winding road with an end in sight. It’s cyclical, and no two days might ever look alike on this journey. There are days I just can’t be a part of the world and all that is going on, and there are days that I can’t wait to get out there and be with everyone and all that is. Those days are not common, but they happen more than they used to. I am sure I seem sad sometimes; I am. I know I must seem angry too; I am. I probably seem very lost; yep, that one too. But I have joyful and happy moments too. It’s all a part of figuring out my life without folks whom I loved and respected and went to when the world came crashing down or everything was awesome. They multiplied my joys and divided my sorrows and were a safe place for me to land. I’m sorry they are gone, but I’m not sorry for missing them. I have to work through it at my own pace, and I need to stop feeling like I need to apologize to everyone for where I’m at. Years ago in my previous life, I had a friend who was a manicurist. She pointed out to me on a Tuesday evening over a beautiful French tip manicure that I said “I’m sorry” way too much. She told me that the world did not need me to nor did it expect me to apologize with every other breath. I felt a little put off at the time, but you know what I said to her? Yep. “Oh, I didn’t realize. I’m sorry.” Sigh. Over the years that conversation has come back to me. And I’ve realized more and more that she was right. I did apologize for things that an apology was not necessary for. As though I need to apologize for my mere existence taking up space. It’s not about others most of the time. It’s about me. Feeling intrusive, inconvenient, and in the way. Troubling others. Yes, occasionally it was because someone made me feel “in the way” or “a bother, ” and other times I needed to offer a real apology. But way too many times, it was about me, myself, and I. And my skewed perceptions. So I’m done. I’m going to try to hold back on apologizing for these things that are a part of my world and just are what they are. Apologizing is not healthy in every case, and if I’m wrong, well…..then. Oh boy, this is going to be a long rehabilitation. Yes, the twelve days of Christmas are over. We spent much of the afternoon putting away our Christmas and tidying up. And I made it through it. Only this year, I made no promises to myself about where we would be when the boxes were opened again. I love the story. The Magi set out looking for the one born to be King of the Jews. They had seen a star indicating that he had been born. They went to Jerusalem and started asking how to find him. When King Herod, a rather jealous king, heard about this, he became worried. He told them to go find this newborn king and then come back and tell him where the baby was so he could go and worship him too. Yeah, right, Herod. I see what you did there. The Magi continued on their journey, and then…..
Here’s what I love most about the story. They were there for the right reasons. They were there to worship the newborn King, not serve Herod and his priorities. When have you ever dreamed with another person? Never, right? So these Magi–some say scholars, others say kings–each of them had a dream…..individually. I’d love to have been a fly on the wall the next morning. Eyes pop and mouths open with disbelief. I love it. I don’t know that this is how it played out–all we are given is one verse for what I think is a very important part of the story…..they were told in a dream, they went back another way. The End. But it’s not. As we listened to this story at Evening Prayer last night, I thought again about how this might have happened. Thank goodness they were obedient, yes, but I am really thankful that the first one spoke up about the dream. Can you imagine the tension inside each one (much like the tension inside of me when a dream is rambling around looking for a way out), fearing that he would have to be the one to share what his dream was–to the disbelief and scowling looks of his fellow travelers? That he would have to be the one to look crazy? And yet, share it he must. Did any one of them understand the real importance of the dream? The importance of obedience? Thank goodness at least one did. And it was a very good thing. But here’s the lesson that sticks with me, in my mind and my heart, from this story. Never be afraid to share your dreams. Who know who else has also been given that dream to make it happen….with you? And that’s what I know. In this year of “with,” in this life of with, I know that nothing I am to do is me and me alone. Our dreams can only come to fruition if shared with others, and if we all work together toward reaching that star…..it is there we will find the Gift it shines to honor. Share your dreams, even if they seem crazy; who knows what good and right things can come from it? Finally, a great song about dreaming from one of my favorite musicals–and yes that is Mr. Donny Osmond…..